Reach-ins, Bottle Coolers, Back Bars, Pizza Prep, Sandwich Tables, Merchandisers, Deli & Pastry Cases, Sushi Cases and more... 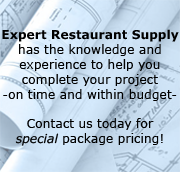 Expert Restaurant Supply is your source for all of your commercial refrigeration needs. Our online selection is continually expanding. If you cannot find what you are looking for or have any questions, you can call us toll free: 800-214-6294 or click here to contact us.